Where did that thrill go? Those who know me now see me as a smooth, confident man of affairs and it will be jarring to learn I have not always been so. It might be impossible for you to believe, but it is true. Around third or fourth grade I was a chubby kid in an ill-fitting polo shirt, squirming in a wood and metal desk while listening to a very near-sighted teacher go over multiplication tables. I had hardly been anywhere in life to that point, but I began to hear rumors of a field trip. Class field trips were usually the sort of event where kids and adults, called chaperones, were shuttled to places like the public library, Cultural Center, or state capitol building. These fine establishments were ready for the influx of pupils and would give out plastic bags with colorful information you would never read and a pencil you would probably lose before you got back home that evening. Chaperones sounded interesting until you saw them and they were just normal people. Of course, after the trips were over, the next item was writing up the dreaded report on the trip. Those reports often went the same way. If there were page or word count requirements, the capitol would become “very big,” the library would have “a whole lot of different books,” and the cultural items would be “very old and very interesting.” One would think teachers would quit requiring such reports, if only to show themselves the mercy of not reading them. Field trips have been going on in that vein for generations, but the rumors of this field trip were different. It was rumored we were going to a place called Camden Park. If you grew up in the ’80s in south-central West Virginia, you are familiar with Camden Park. You’ve had your hand stamped, rode The Big Dipper, and maybe even listened to Freddy Fender rendering his international hit, “Wasted Days and Wasted Nights.” Camden Park is an amusement park in Huntington, WV. It has a long history going back into the early twentieth century when it began as a picnic spot by the railroad and grew by adding rides. 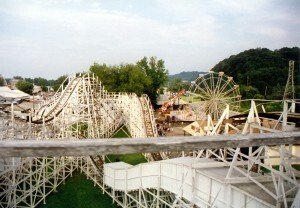 Its signature ride was a wooden roller coaster named, The Big Dipper. The rumors were true and we loaded up one day to drive the hour or so it took to get to the state’s only amusement park. That was an exhilarating day. The park seemed enormous to a kid’s eyes and the rides provided a whole day of thrills. I didn’t muster the courage on that first trip to ride the big roller coaster, but I would ride it later. I would visit that park many times over the next few years and it was always a great day. I drove by the place a few years ago and was underwhelmed. The park looked old and tired and not very big. I appreciate the childhood experiences I had there but know it wouldn’t be the same for me to go there now. No amusement park today could recreate that feeling I had as a kid at such a place. I have taken my own kids to those kind of places and I have a great day with them, but it is a different experience from what they are having and I had when young. No matter what I do, I can’t have that experience again. If next I told you I was going on a quest to recapture the old thrills of my childhood experiences, you might think I’ve cracked up, or you at least know I would be pursuing futility. I can’t become a kid again. If I looked up all my old classmates and headed to Camden Park, it wouldn’t be the same. I can have new experiences but I cannot re-have the old ones. Besides, have you ever noticed the best experiences are had when we are not tying to have an experience? The thrill comes when we are not trying to have the thrill as an end in itself. Whenever we try to contrive or manufacture a particular experience, it never works. A husband and wife will sometimes try to recapture their honeymoon experience years later on some milestone anniversary. They may end up having a nice time, but it will not be the same. They might even have a better time for some reason, but no matter how much effort they expend to make everything just like it was back then, everything is not like it was back then and neither are they. It really is like trying to grab the wind and hold it in your hand. As a kid, I thought I wanted to go to Camden Park everyday. I could ride non-stop and inhale the sugar air known as cotton candy until dark. As an adult, I know the folly of those childish thoughts. The thrills would wear off and I would get tired of the park. The steady diet of high sugar in various forms would make me sick to my stomach. On a different level, I know I would be supremely wasting time. I wouldn’t be accomplishing anything worthwhile. I would be losing opportunity to grow, learn, work, do, and become. Long ago, Solomon pursued pleasure with everything he had, and he had a lot. He found it empty and unsatisfying (Ecclesiastes 2:1-3). To constantly pursue experience and thrills is childish and foolish, even when done in the name of religion or spirituality. When cloaked in a spiritual guise, this folly is not easily recognized. Rather than being decried, the vain pursuit is applauded and promoted as being on fire for God, or experiencing the presence and power of God, walking in the Spirit, etc. Is the Holy Spirit the proprietor of an amusement park? Is he the broker of chills and thrills? Is he the ultimate adrenaline and pleasure button we can push so that a simple church service becomes the setting for exhilaration like that of riding the world’s fastest roller coaster? Is the primary work of the Spirit in a believer’s life to give them the willies every so often? Does the Spirit inspire chaos and confusion? Paul corrected the Corinthian church for their abuse of spiritual gifts and misunderstanding of the work of the Spirit in their midst in 1 Corinthians, chapters 12 to 14. There was confusion and conflict in the assembly at Corinth and Paul concluded warning them that was not of God, “For God is not the author of confusion, but of peace, as in all churches of the saints” (1 Corinthians 14:33). Paul’s argument was that if they were experiencing the power of the Spirit, then the results would be consistent with the nature and character of the Spirit (1 Corinthians 12:4-11). The result of the Spirit’s work is not confusion, strife, and disorder because the nature of the Spirit is not that. We know what the fullness of the Spirit means by the prophecy of the coming Messiah, who would be filled with the Spirit. The fullness of the Spirit does not mean ecstatic excitement, but wisdom, understanding, counsel, might, knowledge, fear of Yahweh, righteousness, and faithfulness. The Spirit’s empowering and enabling is not for some mystical experience, running around, jumping, and hollering. His empowering is for service, just as we see with those who built the tabernacle. The fullness of the Spirit here is seen in terms of wisdom, but also in terms of hard work. What the Spirit inspires is subject to the Father’s will and in step with the Father’s purpose. This was Paul’s prayer for the Spirit’s work in the Colossian church members, and the members of the church in Ephesus as well (Colossians 1:9-12; Ephesians 1:16-17). Paul reminded Timothy of the work of the Spirit resulting in a sound mind, which means self-control (2 Timothy 1:7). Jesus taught the Spirit rebukes and judges sin (John 16:7-11), guides believers into truth by understanding his written word (John 16:13-14; 17:17), and leads believers into obedience to God’s word (John 14:15-26). Wherever the power of the Spirit is, there will be conviction and repentance of sin, a prevailing of wisdom and soberness, and serious service for the work of God’s kingdom. Will we continue to be as children seeking thrills and trying to prolong them? Or, will we be mature and seek the Spirit that we may grow in understanding of revealed truth, that we might walk in righteousness before God, and zealously serve him for the glory of his name? We don’t need the Holy Spirit to feel all tingly. A two-story drop or a high-speed loop can give us that. However, no roller coaster, bungee jump, or sky dive can ever increase our wisdom and understanding of God’s truth.